Idli preparation is a simple yet tricky process. Here is my effort to summarize what I have learnt so far!! Once you get hold of these tools, let us proceed to the method. 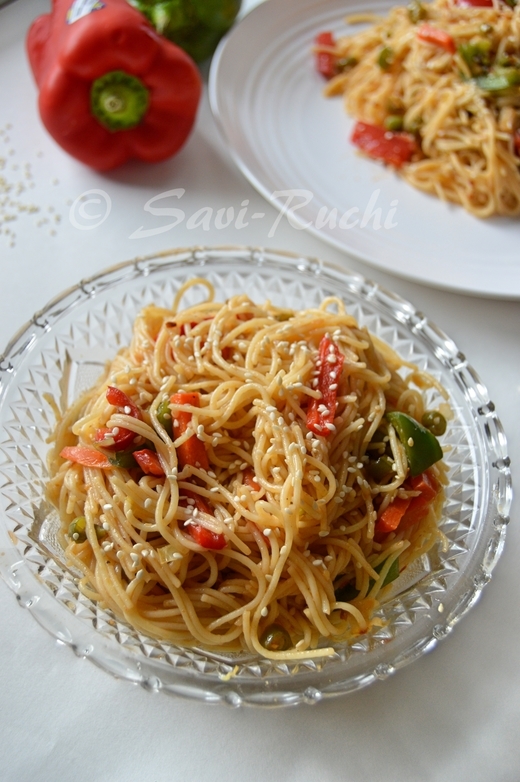 In this recipe, I use de-husked black lentils & akki tari (idly rawa/Semolina). Raw rice or boiled rice is thoroughly washed in water & drained. Then the moist rice is spread on a white cotton cloth. It is dried inside the house or under the shade for a day(up-to 24hours). Once the rice is completely dried, the rice is sent to the flour mill (Flour mills are very common in India. Even a small town will have couple of flour mills) & is instructed to be powdered for idly rawa. After the idly rawa is brought home, it is dried under the shade again for couple of hours to remove the moisture caused by the heat of the machine. 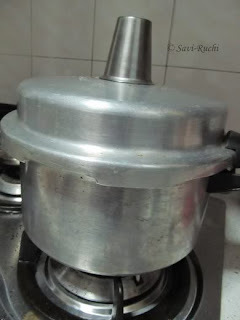 * If you are using wet grinder, use 3 cups of idly rawa for 1 cup of urad dal. If you are not sure about the quality of urad dal &amp are using the mixie/blender/food processor, add 1/2 cup of beaten rice to lentils. Soak both beaten rice &amp lentils together for 3-4 hours. Wash the lentils thoroughly & let them soak for 3-4 hours. Drain the water from the soaked lentils & add them to the food processor jar. Add 2-3 tbsp of ice cold water to the lentils & pulse for few seconds. Add few tablespoons of ice cold water to the very coarsely done lentils & pulse again. Repeat the whole process of adding ice cold water & pulsing for at-least 5-6 times. The lentils must be very smooth & frothy. Scoop out the mixture to a broad vessel. Wash the idly rawa, drain the water from the rawa & mix them with the scooped lentil paste (adjust the consistency of the batter). Mix them well & allow it to ferment overnight or for 10-12 hours. 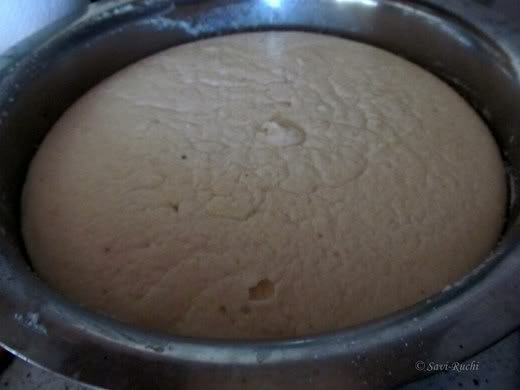 After proper fermentation, the batter would have raised. Grease the idli plates. 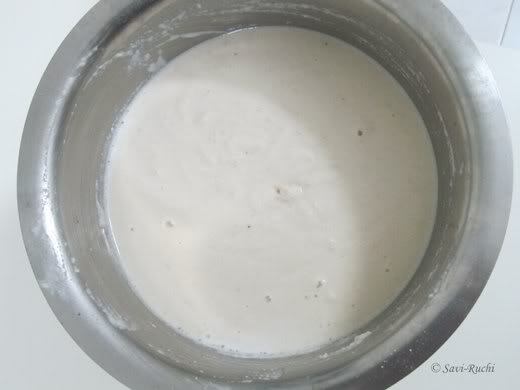 Add salt to the batter & mix it. Pour a tablespoon or a little more of batter to each mould. Place it in the steamer & steam the idlis for 15-20mins. To check if idli is done, insert a tooth-pick, if it comes clean, idlis are properly cooked. Remove the idli stand from steamer & allow it to cool for 2-3mins. Carefully remove the idli using a spoon or knife. Serve it hot with a chutney, sambar of your choice. Don't forget to add ice cold water if you are using food processor to grind the lentils. The motor of the food processor will transfer the heat to the lentil paste/batter. 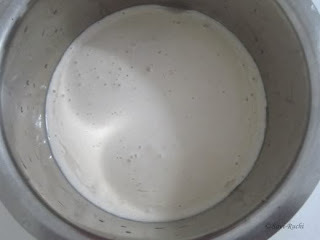 If batter becomes hot/warm, it will not be frothy. So, to keep the batter cold, it is advisable to use ice cold water. While preparing the lentil paste, ensure not to add more water at one point. Keep adding little water & keep pulsing/grinding. This helps in making the batter frothy. Do not grind/pulse for a long time at one shot i.e. pulse only for 30-40secs. Stop and repeat. Ensure no lumps while mixing semolina/rawa to the lentil batter. The consistency of the final batter is very crucial. If the batter is thick, it wont ferment well. If the batter is watery, the idlis become sticky. The batter must be like the tomato ketchup. b) Quality of the urad dal/de-husked black lentils. If 1(black lentils/urad dal):2(idly rava/semolina) ratio does not work for you, try reducing it to 1:1.5 or worst case, try equal proportions.1:1 works for sure!! 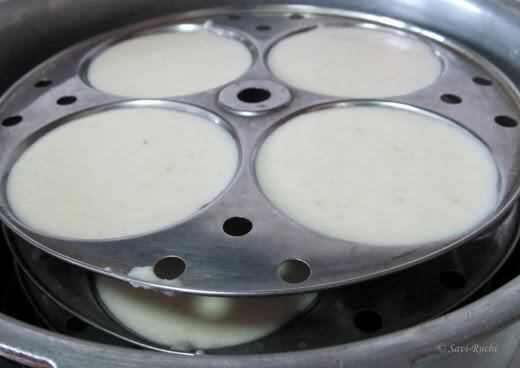 Cooking time of the idli depends on the number of idli plates used. 15-20mins steaming time for 16 idlis(4*4, in my case). Adjust the cooking time according to the number of idlis to be steamed. 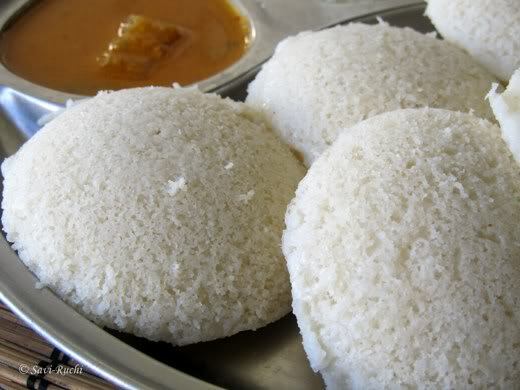 To make idli softer, you can also add a fistful of cooked rice (Grind the cooked rice along with the lentils). In case, you do not have a steamer, use the pressure cooker to prepare the idlis. Do not add the weight, instead place a steel tumbler (as shown below). Yum Yum...Love Idlis. Ice cold water tip is cool! Here during winters making Idli is no less cumbersome than a laboratory experiment!! 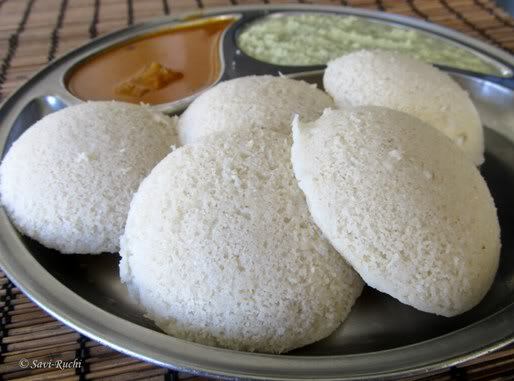 Soft and yummy idlis..perfect breakfast. Will try ur version soon! !